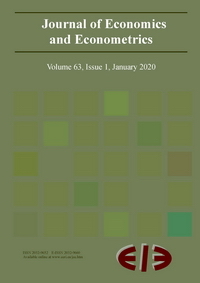 The Journal of Economics and Econometrics is dedicated to publishing original scholarly contributions that systematically analyse economic issues and, as such, quantitative methods should form a significant component of the article. All manuscripts should be submitted via e-mail to jee@eeri.eu in Tex/LaTeX, Word, or Rich Text Format file formats. It is not necessary for a manuscript to conform to journal style at the time of submission. All accepted manuscripts, however, must be revised by the author to conform to the style. This journal employs peer-review process in selecting the articles. To protect their anonymity in the review process, authors should not identify themselves in the manuscript. A separate title page must be sent as an attachment to the editors. Upon acceptance of an article, authors will be asked to sign a 'Journal Publishing Agreement' send via e-mail to jee@eeri.eu. Acceptance of the agreement will ensure the widest possible dissemination of information. An e-mail will be sent to the corresponding author confirming receipt of the manuscript together with a 'Journal Publishing Agreement'. Articles must be written in good English. Manuscripts should be double spaced (flush left) and with wide margins. All pages should be numbered consequently. Titles and subtitles should be short. Tables, and figures should be listed at the end of the article. Title page should contain the following information: (i) Title (bold, flush left); (ii) Names of author(s) (bold, flush left); (iii) Abstract (flush left) of 100 or fewer words; (iv) Five or fewer Keywords (flush left) (Example: Keywords: public policy, regional economics. ); (vi) Name, address, telephone, fax number, and e-mail address of the corresponding author; and (vi) Unnumbered footnote for institutional affiliation(s) of the author(s) (Example: Eric Smith is associate professor at the Department of Economics, Horow University. The authors thank Aton Sarah for helpful comments on an earlier version of this manuscript. The authors acknowledge financial support from National Science Foundation.). Fully reference all prior work on the same subject and compare the submitted paper to that work. All data used in analysis must be clearly and precisely documented. All data used in analysis must be made available to any researcher for purposes of replication. Any requests for an exemption from the data availability policy must be made in the cover letter when the paper is first submitted. Tables should be numbered consecutively in the text in Arabic numerals and listed at the end of the article. Place legends for tables at the top of the table, flush left, and bold (Example: Table 1. Summary Statistics for Survey Sample, 1993-1997). Figures should be numbered consecutively in the text in Arabic numerals and listed at the end of the article. Place legends for figures at the bottom of the figure, flush left, and bold. (Example: Figure 1. Inflation in EU, 1999-2004). Use lowercase for the words “table” and “figure” in the text unless, of course, they appear at the beginning of a sentence. Equations to which reference is made in the text should be numbered consecutively. Equation numbers should be placed in parentheses against the right margin of the text. The use of footnotes should be kept to a minimum and numbered consecutively throughout the text with superscript Arabic numerals. Place footnotes at the bottom of the page on which they are referred to. Place the footnotes below the bottom line of the table in (un-indented) paragraph form (Example Note: * and ** denote variables significant at 5% and 10% respectively). Failure to submit papers in accordance with the format detailed above may result in the return of the manuscript for correction before publication. Use the following style for References and Citations.